We humans have always considered ourselves different from every other species on Earth. But as time goes on, scientists repeatedly show that the traits we consider unique and based on a superior intelligence are also found in most animals. One of these is the trait of laterality. The term laterality refers to the primary use of the left or right hemispheres of the brain. The two halves of the animal brain are not exactly alike. The left hemisphere controls the right side of the body and the right controls the left side. Most people are right handed because it is thought that the left hemisphere makes the right side stronger. Also, in 90-92 per cent of all humans, the left hemisphere controls language. Despite the varied structures of animal brains, many mammals, birds, fish and invertebrates have the same trait of laterality. Many animals use their left eye and left ear (indicating right brain activation) more often than the right ones when investigating objects that are potentially frightening. Left-handed people are more vulnerable to stress as are left pawed dogs and many other animals. Right-handed animals have better immunity. 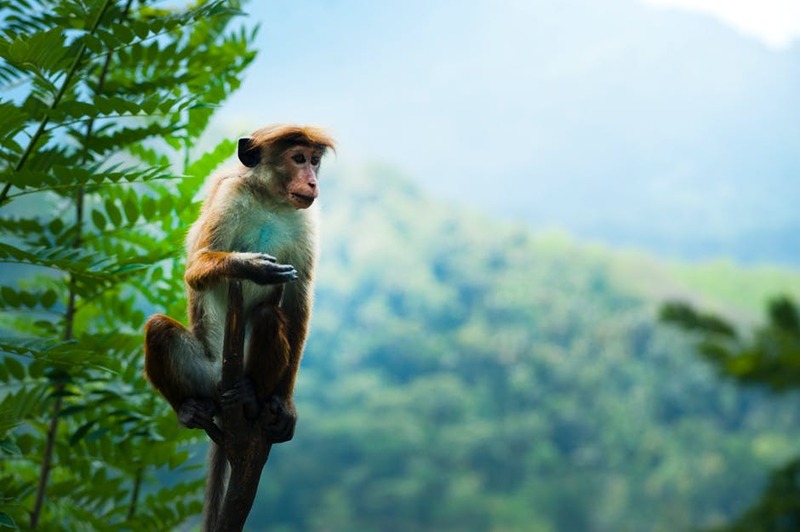 A 1987 study by leading animal behaviour scientists, MacNeilage, Studdert-Kennedy and Lindblom, showed that macaque monkeys have a left-hand preference. For primates, a left-hand preference was observed for visually guided reaching movements and a right-hand preference for manipulating objects. In prosimians (non-ape primates like bush-babies, lemurs, etc), the right hand is used for major tasks, like grasping a branch after a leap, and the left is used for quick small movements, like catching insects. Young horses prefer breathing with their right nostrils. Horses with a higher emotional content prefer looking with their left eye! Recent research in Applied Animal Behaviour Science, though, showed that about 53 per cent of horses prefer to lead with the right leg. Dogs prefer one paw to another – except when they are frightened by noise (Bransonn and Rogers, 2006). Trainers of guide dogs, in fact, test them for laterality, as the dog may be better at walking to the left, or the right, of their blind owner. Cattle prefer viewing new things with their left eye (as do magpies, chicks, toads and fish) and familiar things with their right eye. Bats show a left-hand bias for climbing or grasping. Kangaroos use their left hand for things that require fine manipulation, but the right hand for behaviour that requires physical strength. Most parrots favour one foot when grasping objects, usually the left. The Zebra finch male views the female with his right eye when courting her (Workman & Andrew, 1986). Emei Music frogs listen to positive signals (like a mating call) with their right ear and with their left negative signals. The presence of laterality in the brains of birds is particularly interesting, as humans had always believed that it could only be possible if there was a corpus callosum in the brain. Avian brains do not have a corpus callosum at all, but still display laterality. In fact, there is similarity between the avian and human brain when it comes to laterality. The songs of the song-bird species is also controlled by the left hemisphere. There is also similarity in the syntax of bird songs and human languages. Birds go one better, however, as the brains of birds have both hemispheres working to control singing/language, while humans only possess this ability in one hemisphere. In the same way, as we humans can open a door with either hand equally, yet struggle to write legibly with our non-dominant hand, complexity of the task appears to be an important factor in the handedness of animals. Animals that do activities requiring significant levels of dexterity, show evidence of a preferred “handedness” . Italian researchers, Quaranta, Siniscalchi and Vallortigara, found that dogs wag their tails to the right when they see positive stimuli which they want to approach, and they wag to the left when confronted with something they would like to avoid. There is some evidence to suggest that dogs and cats can be right- or left-pawed, although the ratio seems to be more evenly split than in humans. In one study 46 per cent of cats used only the right paw in reaching for food, 44 per cent the left, and 10 per cent were ambilateral. Determining which side of the brain dominates the other could change the way domestic animals are bred, raised, and used, including predicting which puppies will make the best service dogs, and which racehorses will race better on left or right curving tracks. So, another myth of man’s superiority bites the dust.